Nothing cerebral today. I go back to work tomorrow; I’m still sick from Wednesday; and it’s so dry in my house, I had a two-hour nose bleed today. So yeah, nothing ground breaking today, but I will give you a laugh. My friend gave mt this book as a Christmas gift. Knowing nothing about the original, I looked it up. Turns out, How to Avoid Huge Ships is a real book originally published by a small boat captain for a very niche market. However, like the internet do, people flocked to Amazon and wrote some amazingly funny reviews of this book. Actually, there are over 1,400 of them! 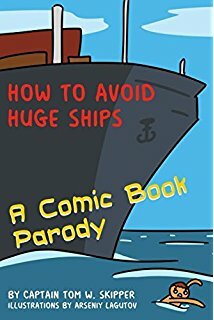 This book compiles some of those reviews/ideas and creates little cartoons for each of them. It’s a nice little piece in a parody collection or if you were/are a massive fan of the 1,400 reviews on Amazon. Will anyone remember this years from now? Who knows, but the original came out in 1982, so this book does have something to it.